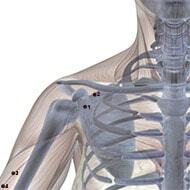 Lung Meridian / Channel Acupuncture Points. -Governing qi and controlling respiration. They take in clear and expel turbid Natural Air Qi (Kong Qi). -Controlling the skin and body hair. This meridian contains 11 acupoints in one side, that is 22 acupoints in total. Location: Laterosuperior to the sternum, 1 cun below Yunmen (LU-2), at the level of the first intercostal space, 6 cun lateral to the anterior midline. Indications: Cough, asthma, pain in the chest, shoulder and back; fullness of the chest. Acupuncture Method: Puncture obliquely 0.5-0.8 cun towards the lateral aspect of the chest. To avoid injuring the lung, never puncture deeply towards the medial aspect. Moxibustion is applicable. Vasculature: Superolaterally, the axillary artery and vein, the thoracoacromial artery and vein. Innervation: The intermediate supraclavicular nerve, the branches of the anterior thoracic nerve, and the lateral cutaneous branch of the first intercostal nerve. Location: In the superior lateral part of the anterior thoracic wall, superior to the coracoid process of scapula, in the depression of the infraclavicular fossa, 6 cun lateral to the anterior midline. Indications: Cough, asthma, pain in the chest, shoulder and arm, fullness in the chest. 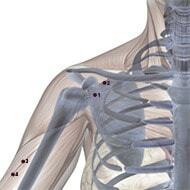 Acupuncture Method: Puncture obliquely 0.5-0.8 inch towards the lateral aspect of the chest. To avoid injuring the lung, never puncture deeply towards the medial aspect. Moxibustion is applicable. Vasculature: The cephalic vein, the thoracoacromial artery and vein; inferiorly, the axillary artery. Innervation: The intermediate and lateral supraclavicular nerve, the branches of the anterior thoracic nerve, and the lateral cord of the brachial plexus. Location: On the medial aspect of the upper arm, 3 cun below the end of axillary fold, on the radial side of m. biceps brachii. Indications: Asthma, epistaxis, pain in the medial aspect of the upper arm. 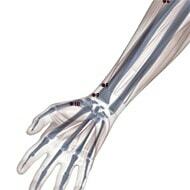 Acupuncture Method: Puncture perpendicularly 0.5-1 inch. Vasculature: The cephalic vein and muscular branches of the brachial artery and vein. Innervation: The lateral brachial cutaneous nerve at the place where the musculocutaneous nerve passes through. 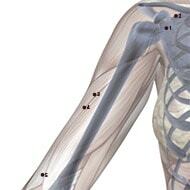 Location: On the medial aspect of the upper arm, 4 cun below the anterior end of the axillary fold, or 5 cun above the cubital crease, on the radial side of m. biceps brachii. Indications: Cough, fullness in the chest, pain in the medial aspect of the upper arm. Vasculature: The cephalic vein and mus, cular branches of the brachial artery and vein. Innervation: The lateral brachial cutaneous nerve at the place where the musculo-cutaneous never passes through. Location: On the cubital crease, in the depression of the radial side of the tendon of m. biceps brachii. This point is located with the elbow slightly flexed. Indications: Cough, hemoptysis, afternoon fever, asthma, sore throat, fullness in the chest, infantile convulsions, spasmodic pain of the elbow and arm, mastitis. Vasculature: The branches of the radial recurrent artery and vein, the cephalic vein. 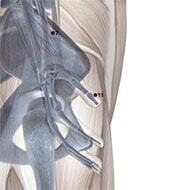 Innervation: The lateral antebrachial cutaneous nerve and the radial nerve. Location: On the palmar aspect of the forearm, on the line joining Taiyuan (LU-9) and Chize (LU-5), 7 cun above the transverse crease of the wrist. Indications: Cough, pain in the chest, asthma, hemoptysis, sore throat, spasmodic pain of the elbow and arm. Vasculature: The cephalic vein, the radial artery and vein. Innervation: The lateral antebrachial cutaneous nerve and the superficial ramus of the radial nerve. 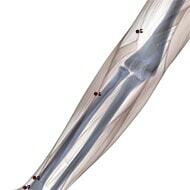 Location: Superior to the styloid process of the radius, 1.5 cun above the transverse crease of the wrist between brachioradial muscle and the tendon of long abductor muscle of the thumb. When the index fingers and thumbs of both hands are crossed with the index finger of one hand placed on the styloid process of the radius of the other, the point is in the depression right under the tip of the index finger. Indications: Headache, migraine, neck rigidity, cough, asthma, sore throat, facial paralysis, toothache, pain and weakness of the wrist. Method: Puncture 0.3-0.5 inch obliquely upward. Moxibustion is applicable. Vasculature: The cephalic vein, branches of the radial artery and vein. 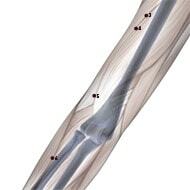 Location: 1 cun above the transverse crease of the wrist in the depression on the lateral side of the radial artery. Indications: Cough, asthma, fever, pain in the chest, sore throat, pain in the wrist. Acupuncture Method: Puncture perpendicularly 0.1-0.3 inch. Avoid puncturing the radial artery. Vasculature: Laterally, the radial artery and vein. 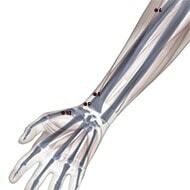 Location: At the radial end of the transverse crease of the wrist, in the depression on the lateral side of the radial artery. Indications: Cough, asthma, hemoptysis, sore throat, palpitation, pain in the chest, wrist and arm. Acupuncture Method: Puncture perpendicularly 0.2-0.3 inch. Avoid puncturing the radial artery. Moxibustion is applicable. Vasculature: The radial artery and vein. Innervation: The lateral antebrachial cutaneous nerve and superficial ramus of the radial nerve. Location: On the radial aspect of the midpoint of the first metacarpal bone, on the junction of the red and white skin (i.e., the junction of the dorsum and palm of the hand). Indications: Cough hemoptysis, sore throat, loss of voice, fever, feverish sensation in the palm. .
Vasculature: Venules of the thumb draining to the cephalic vein. Location: On the radial side of the thumb, about 0.1 cun posterior to the corner of the nail. Indications: Sore throat, cough, asthma, epistaxis, fever, loss of consciousness, mania, spasmodic pain of the thumb. Vasculature: The arterial and venous network formed by the palmar digital proprial artery and veins. Innervation: The terminal nerve network formed by the mixed branches of the lateral antebrachial cutaneous nerve and the superficial ramus of the radial nerve as well as the palmar digital proprial nerve of the median nerve. 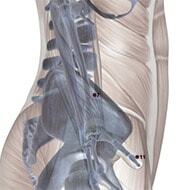 This meridian originates from the middle energizer, running downwards to link with the large intestine. Winding back, it goes along the upper orifice of the stomach and passes through the diaphragm, entering the lung, its pertaining organ. Then it reaches the throat, runs transversely along the superolateral aspect of the chest (Zhongfu, LU-1) and finally emerges from the axilla. Descending along the anterior border of the medial aspect of the upper limb, it passes through the cubital fossa and enters Cunkou. 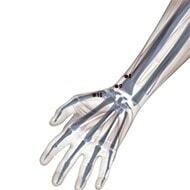 Passing the thenar eminence and going along its redial border, it ends at the medial side of the radial tip of the thumb.